If you would have told me 7 years ago when I found Papertrey Ink, that I would one day be on this team, I wouldn't have believed it. I am still pinching myself and its already been a year! And an amazing year at that! The first card, top left, uses A little Argyle and I just love that background! The top middle card uses the Modern Cross Quilt Cover plate and some ink blending. This is definitely one of my favorite cards from back in April of this year. The top right project is a paper bag book of my daughters first year of school. I used Teacher's Apple thought this book. It was so fun to make! There gorgeous butterflies are from Life is Beautiful and I love how they look in vellum. And that chevron background....so fun! I am a sucker for white space and this card has always been a favorite. I used Butterfly Dreams to stamp that buterfly and layered it up with some Basic Background: Text Style in the background. The moroccan style background of the background made me so happy! I love this set called Basic Background: Retro. This next card, bottom left, makes me smile! I loved this card so much and those rolled flowers and that polka background! Hello Sunshine is such a fun set and I had a ball making this card. I love Lemon Tart and Summer Sunrise inks and it made for a bright and cheery card. I am super excited about this week to come! Stayed tuned for so so many fun announcements and things to see! Thank you so much for all of your support and comments and friendships I've made over the last year. I do love this hobby and all of you! Head on over to Nichole's blog to see more! Happy Anniversary! PTI made an excellent choice adding you to their team. I've really enjoyed seeing your creativity throughout the year. I love your CAS style. You have inspired me greatly with PTI products, Laurie! You ROCK!!!! You have rocked this year with PTI! Always excited to see what you make Laurie!!! Thanks for all of your wonderful inspiration each month! So happy you are part of the PTI team!!! Looking forward to another incredible year! WE have LOVED having you on the team, Laurie! Your style is so fresh! Love your style, Laurie! Thanks for sll the inspiration that you've provided me with this year. You've been amazing! Great choices, Laurie, but any of your projects fit that category! I've been a fan of your blog for many years and was delighted when you joined my favorite creative team a year ago. Very best wishes for another super year at Papertrey Ink! It's so fun to see old and new projects and how your style has evolved. Thanks so much for sharing! I really enjoy the quiet elegance in your cards. Looking forward to seeing your PTI projects in 2015! You have been a great addition to the PTI team, this year. Your CAS work is creative and inspiring. I love your favorites, and for that matter, all of your lovely creations every month. What great inspiration you give to a CAS person like me. I remember all of these Laurie, fabulous! Happy 1st Anniversary with PTI!! Gorgeous cards, Laurie! I love that you are a part of the PTI DT! You are one of my favourite designers! Your smart, clean style shines in your PTI projects! So glad you're part of the team and so generous with great ideas and inspirations. 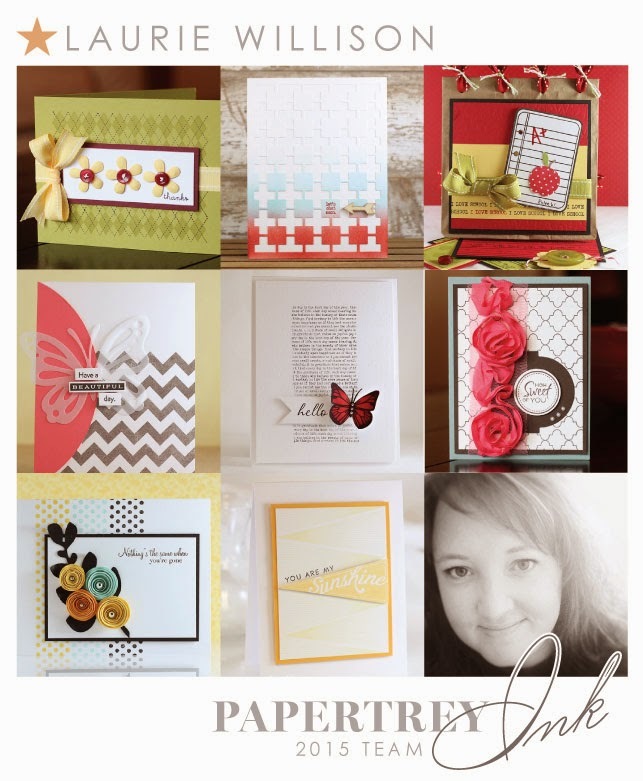 Laurie - Love your cards and style. Thanks for sharing your talent with all of us. Love your style, love your cards and PTI is so lucky to have you on board! Yes, yes, wonderful choices, Laurie! Big congrats on a wonderful year at Papertrey. It's always fun and inspiring to see what CAS designs you will come up with for each set. Here's to another exciting year! Laurie, all of your cards are so thoughtful and gorgeous! You and PTI just go together!! Laurie, I so appreciate the inspiration you provide for guy cards. I tend to add more embellishments, so your CAS style helps me to tone down my approach and come up with ideas for my BILs and nephews. That being said, my favorite card of yours from this year is wonderfully feminine. It's the card you made for the 100th CAS(E) this sketch challenge using Floral Flaps. Love that card. So how does it feel to no longer be the new kid on the block?